Altec Lansing has announced the latest addition of its inMotion family – inMotion Classic (iMT620), the portable music system which designed for Apple’s iPod and iPhone, featuring built-in FM radio tuner, high-contrast LCD display and rechargeable battery, aiming to offer advances in portability as well as audio performance. Audio Alignment – Drivers, enclosure and electronics are balanced for optimum sound. Clear, digital sound pushing full, pulsing bass – Digital signal processing technology delivers thumping bass. Versatile handle – Swing back for a kick stand, swing up to grab and go, tuck away to pack. Digital FM radio – Tune in with a retractable antenna, LCD display and station presets. High-contrast LCD – Always know your beat. Track, artist, album and station display. Music pause – Automatically pauses music when a call is received on the iPhone. Interference-free – Unique design is immune to mobile phone interference, eliminating the need to switch to airplane mode. Auxiliary input – Switch it up by connecting a second audio source. 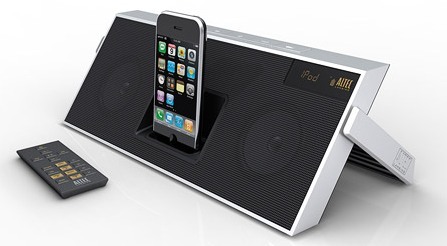 Universal dock for iPhone and iPod – Recharges while it plays your tunes. Compact and lightweight – Easy to carry, easy to use. Remote cubby – Stow the remote away. Onboard controls – Power, audio source, volume, FM radio and song navigation. Rechargeable battery supports up to 5 hours of unplugged music. Full-feature remote provides complete control over menu and music options. The new Altec Lansing inMotion Classic (iMT620) which measures 11.1 (W) x 1.7 (D) x 6 (H) inches will ship in mid-September 2009 at Best Buy, Apple retail stores, Apple.com, Amazon.com, ToysRUs, www.alteclansing.com and more retailers for about $150.